Almost three months after a dozen North Side women reported being groped by a man on a bicycle, Chicago police say there’s been another incident. This time, they have a photo of the suspect. Police have not officially connected the latest incident with the assaults they detailed in a September community alert. But the cases have similar details and suspect descriptions. 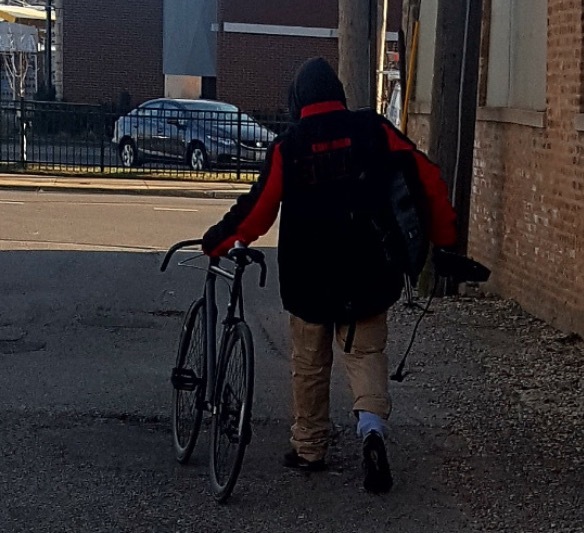 Cops just released this image of a man who they say approached a woman from behind and inappropriately touched her through her clothing in the 3200 block of West Foster around 9:20 this morning. The victim was walking when he approached her, then he climbed onto his bike and fled northbound on Sawyer, police said. The suspect is a Hispanic man in his early- to mid-20’s who stands about 5’7” tall and weighs 160-170 pounds, according to the police alert. He was last seen wearing a black and red jacket with the word “CHICAGO” written on the back. Anyone with information about the suspect is asked to call Area North detectives at (312) 744-8261.